What's new in MSU VQMT 11? Download FREE non-commercial version with limitations or Buy PRO. MSU Video Quality Measurement Tool (VQMT) is a program for objective video quality assessment. It provides functionality for both full-reference (two videos are examined) and single-reference (one video is analyzed) comparisons. Basic scheme of the tool is illustrated on below. Video quality is a characteristic of a video passed through a video transmission/processing system, a formal or informal measure of perceived video degradation (typically, compared to the original video). Video processing systems may introduce some amounts of distortion or artifacts in the video signal, so video quality evaluation is an important problem. 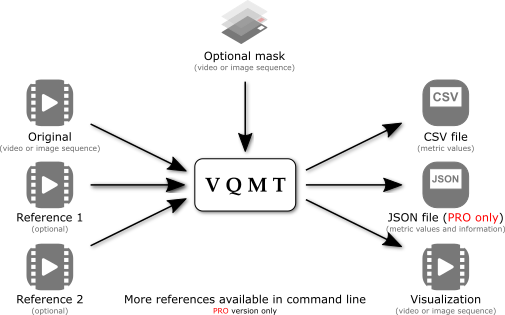 MSU VQMT is a program for video quality measurements. This application allows you to create objective comparison of video codecs and perform video processing filters analysis. * Corresponding "bad frames" are saved automatically as BMP files. Allows to calculate metrics in Regions of Interest (ROI). ROI should be specified by additonal provided video with mask for each frame. Video visualization file is generated for combination [metric, color component, reference]. Color and luminance of each pixel in visuzalization video is defined by metric value in that pixel (very useful for codec and filter debugging). Metrics results and average values are saved in set of *.CSV (comma-separated values) file which can be opened everywhere. All metric results and information about file opening are saved in single JSON file or stdout of command line utility. Free version license agreement allows only personal usage. Multiple references can be compared against the original simultaneously. VQMT provides GUI and command-line (CL) interfaces. It is possible using CL-tool to calculate several metrics for a given set of color components simultaneously and for more files (in parallel), thus achieving significant speed advantage comparing to case of using GUI tool. Processing of video with resolution equal or higher than 1280x720: HD, FullHD, 4K, 8K video. Back SDK allows companies to integrate it's own products with VQMT metrics. Proceed to purchase SDK: Buy SDK. These plots were built in MATLAB, based on measurement results from MSU VQMT. Example of the error in codec, detected with VQMT. Another examples of plots built based on VQMT output. Support of perspective and modern VMAF metric. Many settings guarantee full metric support. Now it's possible to determine quality even without a reference via new NIQE metric. Improved usability: Drag & Drop files and changing of file order by single click. Using single image as source do not truncate all other inputs to one frame. Fixed crashes when use plugin metric. Improved video previewing, fixed opening visualization video inside VQMT. Fixed possible incorrect negative PSNR. Recognize patterns 720p etc. in the name of RAW file to detect resolution automatically. Hotkeys in Preview and Fullscreen window considerably improved. Allow to change video source and frame inside Fullscreen window. Bugfixes in Preview window performed. Fixed green frame in some types of file, incorrect reading of some color spaces. Added new visualization methods: Lossless Video, Lossy Video and TIFF files. Improved command line output in PRO version. Seeking and offsetting YUV files fixed. Added support for OpenCL device interface. Efficient calculation on different devices. Speedup of PSNR and SSIM metrics. Added support for JSON output in console. Incorrect results with RGB metric on RGB video fixed. Fixed bug: hangs in console while using files in network directories. Fixed incorrect behavior of .Y4M files in GUI. Fixed crashes when the length of all files was not able to be detected." VQMT became about 3 times faster. 16 and 32 bpp floating point TIFF files supported (PRO version). Added вЂњ-threadsвЂќ command line argument to PRO version, which allows to control CPU usage. Advanced mask processing - allowed shifts from exact black color for indication black area. Fixed crashes and incorrect results while using mask. Files incorrect behaviour of .Y4M files in GUI." Support comparing ranges of input videos. Fixed crashed while using YUV files with more than 8bpp. Corrected RGB <-> YUV conversion procedures. Fixed incorrect transformation for some input formats. 10, 14 and 16 bpp RGB format plain order changed to R, G, B. Memory leak fixed in VQMT. Fixed crashes and hangs after: the press of Process button, viewing of analyses result, other events. Program crashes due memory lack when -metr ALL specified with large (i.e. 1280x720) video frames. Not existing directory specified in "-cod" parameter will be created now and processing will not cancel. New dialog with visualization of the comparison and for comparison of the selected frames added.